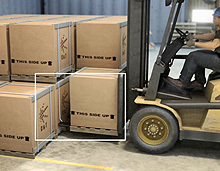 Less product damage is an added benefit to professional forklift operator training. Operators need to be able to accurately judge: fork height, fork length, and tilt angle to avoid damaging loads. Broken pallets can further complicate safe handling. All subjects covered in our on-site forklift training.